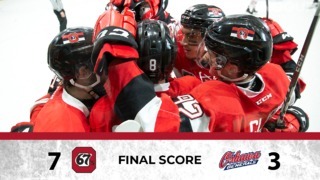 The 67’s are back on the road this weekend, with stops in North Bay (Thursday at 7 p.m.), Sault Ste. Marie (Friday 7:07 p.m.) and Sudbury (Sunday 2 p.m.). After dropping their first three games of the season, the Barber Poles have been red hot, winning eight of their last 10 games. 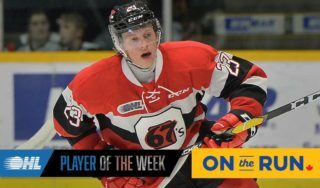 Their improved team play and offensive outburst have vaulted the 67’s into second place in the OHL’s East Division. Captain Travis Konecny also broke out of an 11-game goalless drought and now sits tied for the league lead in points (22) with Erie’s Alex DeBrincat. 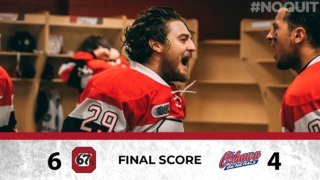 In their last game at TD Place, the 67’s showcased the elite skill that their roster possesses. Forward Dante Salituro scored twice and added an assist in a dominant 4-1 victory over the Peterborough Petes. Netminder Leo Lazarev also looked very sharp, stopping 33 of 34 shots and improving his record to 5-1. Unlike Ottawa, the North Bay Battalion have struggled over the past few weeks. 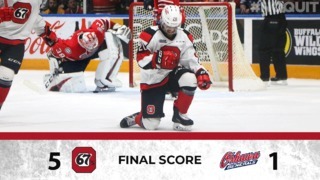 They started the 2015/16 season similarly to the 67’s, losing their first three games and then winning their next four. After that though, North Bay has lost four of their last five. They’ll be looking to get back on track against the 67’s tonight, though the Battalion will have to do so without three of their top six defencemen. Kyle Wood and Brady Lyle are both sidelined with injuries, while Zach Shankar was suspended two games after earning a game misconduct for a slew foot against the Mississauga Steelheads on Sunday. The Battalion won’t be an easy out for Ottawa though, North Bay head coach Stan Butler is known for preaching defence first and always designs strategic game plans for every opponent. Ottawa returns to TD Place on Friday, November 6 at 7 p.m. against the Kitchener Rangers. Tickets are available here, or by calling 613-232-6767, x1. Catch the 67’s live on Rogers TV Ottawa (Cable 22) or listen to tonight’s game on TSN 1200.